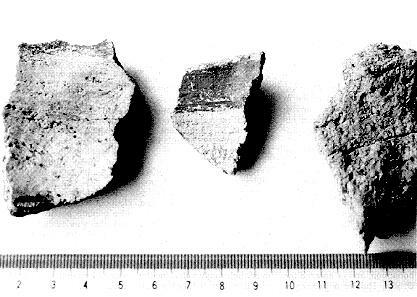 KAGOSHIMA (Kyodo) Three ancient red earthenware fragments, estimated to date back 9,000 to 10,000 years in an early stage of the Jomon Period, were found recently among ruins in Kagoshima Prefecture, a prefectural archaeological research institute has announced. The fragments, which researchers believe to be the oldest of their kind, were found in the Inarihara ruins in Ijuin on the central Satsuma Peninsula. The interior side of the artifacts are colored red. Similar earthenware fragments belonging to roughly the same period were previously found in the Iwamoto ruins in Ibusuki, near the southern tip of the Satsuma Peninsula, the Kagoshima Prefectural Buried Cultural Properties Center said. Tatsuo Kobayashi, a professor of archaeology at Kokugakuin University, said that in many cases, the color red was believed by ancient people to have magical powers. "Because red was found inside the earthenware pieces, they probably were not ornaments." he said, adding that they were perhaps used in some ritual. The Ijuin Municipal Board of Education said the largest piece measures 4 cm by 7 cm. Kobayashi thinks that "bengara," or oxidized iron, was used to produce the red color. Researchers determined the period of the pieces by studying the type of earthenware and the layer of earth where they were found. The layer is made of volcanic ash from Mount Sakurajima. In the Jomon Period, red and black were the main colors used for earthenware. The Inarihara ruins are referred to as complex ruins since they date from the early to late Jomon Period. Digging started at the site in November 1996, covering about 600 sq. meters. About 2,000 pieces of earthenware and stone tools were found. After the dig was completed last January, researchers discovered the red-colored earthenware among the archaeological finds.